Over on Green Tractor Talk there are a few threads and posts about dolly builds for the 260 backhoe. There’s obviously room for interpretation about how to put one together but I was hoping to find some clear direction about what might be best. I didn’t find that, so I set out to build and document my attempt so that others would know how to duplicate and improve upon my work. Follow my thread: 260 Backhoe Dolly Build. First up: the casters. 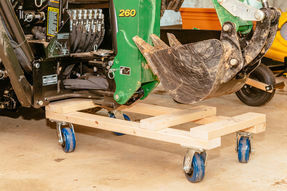 I wanted big and fat ones so that the backhoe would roll easily on the concrete of the garage and maybe be manageable on the hard-packed dirt driveway. 5” casters seemed the biggest I could go, however most of the 5” options used only 1” - 1-1/4” wide tires. I eventually found that Harbor Freight has some 5” x 2”-wide casters. These are some big and weighty casters! They don’t have locks, but otherwise fit the bill. I bought four of them, all swivel. Patrick helped me take advantage of 25%-off coupons so the total cost was just over $50 for them. The casters have big mounting plates so I got 3/8” lag bolts to mount them. In each caster plate I used two 2-1/2” lag bolts to go through two pieces of 2x4, and two 1-1/2” lag bolts to mount the other side that only goes through one 2x4. Washers on all of them. And a couple 2x4s, of course. 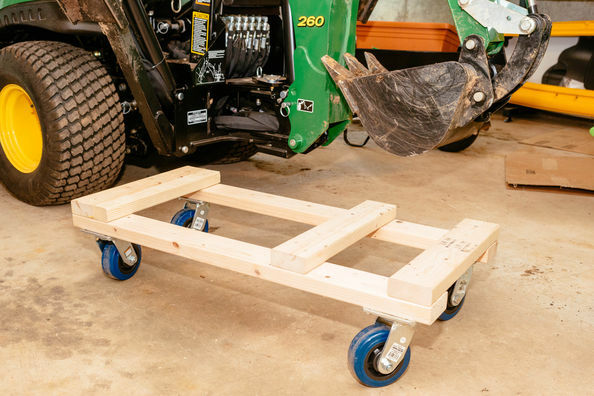 The dolly measures 40” long and 18” wide. There are three 18” wide support members. The gap between the first and second member (where the bucket sits) is 7”. I ripped another piece of 2x4 to 2” wide, and this is against the support member where the backhoe frame sits. 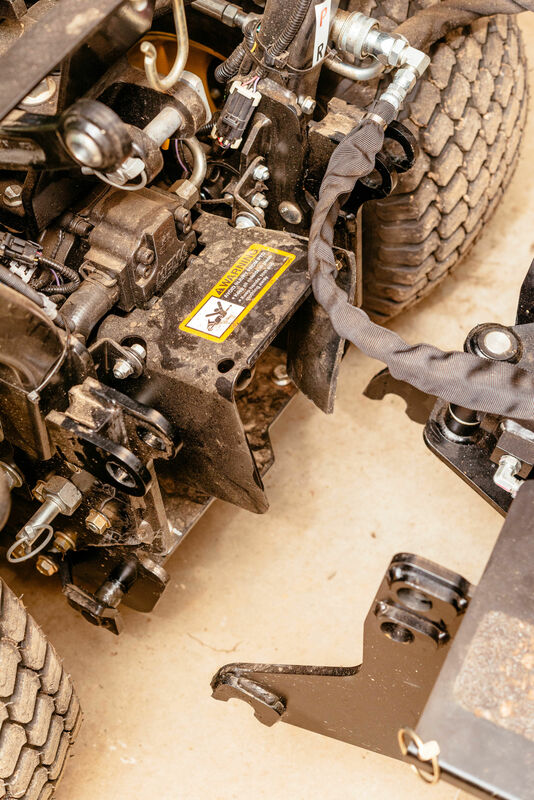 This 2” wide piece is important because it brings the height of the backhoe frame closer to the dolly at the point where the backhoe will pivot off of the subframe on the tractor. A handful of deck screws holds it all together. 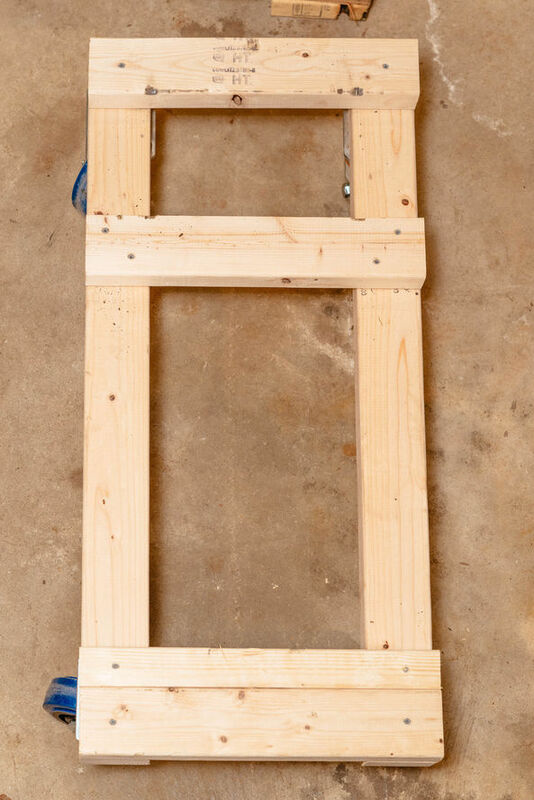 I set the casters 1-1/2” in from the edge of the dolly frame, just because I thought it looked nice spaced like that. Total cost was under $60. The dolly is low enough to roll under the backhoe. It angles between the left-right swivel for the boom and the stabilizer. 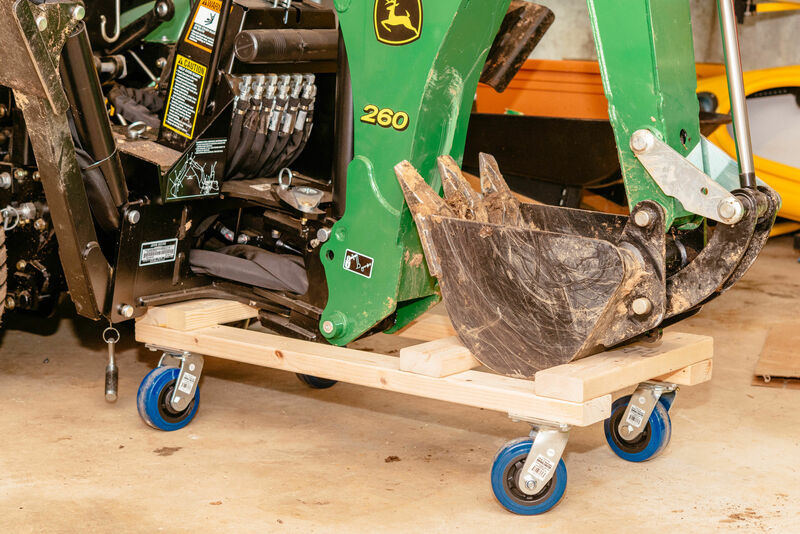 There’s less than 1/2” of clearance between the top of the dolly and bottom of the backhoe so there’s not a lot of room, but it fits in easily. Line up the dolly below the backhoe. The dolly is just long enough to get the backhoe off. The bucket needs to be lowered into a somewhat-level position and the dipper stick needs to be as close to the tractor as it’ll get. Under the backhoe, the dolly will bump the left-right swivel pivot for the boom. 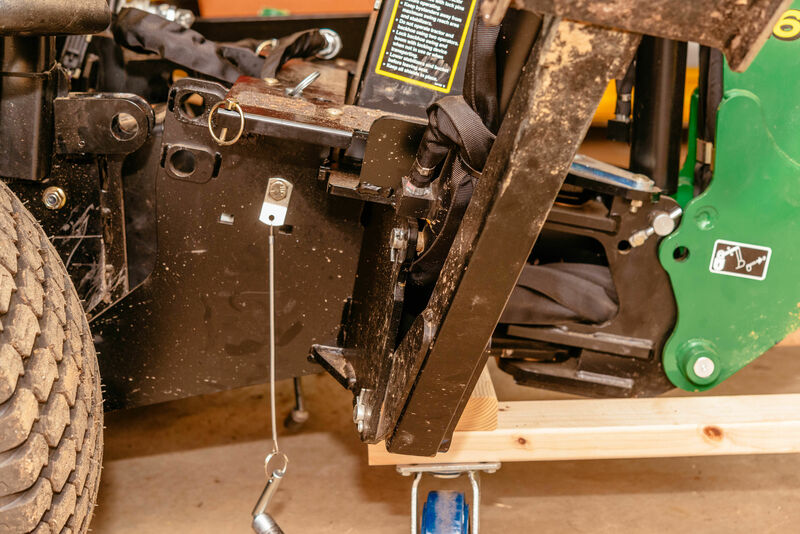 Lower the boom to the dolly enough to take pressure off of the backhoe subframe so that the pins can be released from the top of the subframe, then raise the boom to lift the backhoe off of the backhoe subframe. Stabilizers don’t need to be lowered. That extra piece of 2” wide 2x4 allows the backhoe to pivot off of the subframe and easily clear it. Here the boom arm is all the way “up,” tilted back onto the dolly and the backhoe pulls away! 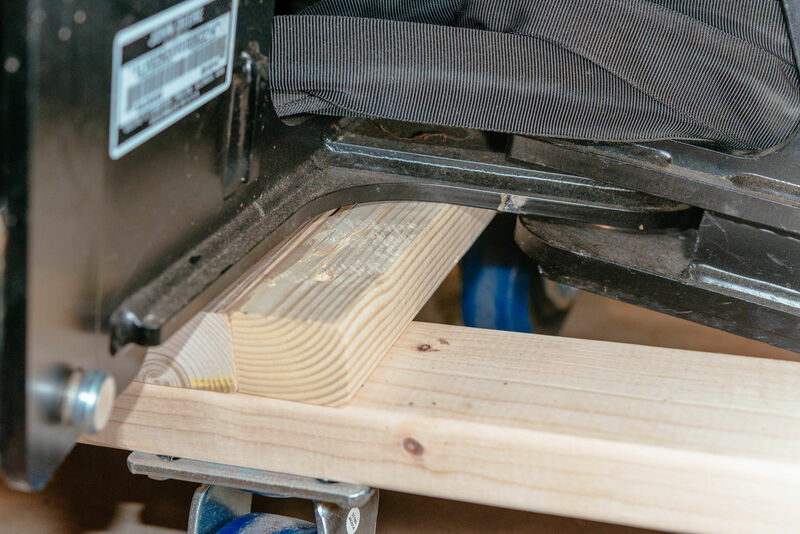 Most obviously, the dolly could be two inches shorter, negating the need for the extra 2” wide 2x4. I should have used 2x6s for the long pieces. The caster plates are big, slightly wider than the 2x4 (so, probably about 3-3/4” wide). I hope there’s enough material left on the 2x4 around the screw holes to support the weight of the backhoe. Using 2x6s would have provided that extra width. Caster selection is a big consideration. Harbor Freight has 6” x 2” casters that I looked at using, but I’m fairly certain they are too big, even if the caster is mounted to the 18” horizontal supports on the dolly, preventing the dolly from rolling under the backhoe. These are some big casters, though. Most of the other (narrower-wheel) casters are not quite as tall. 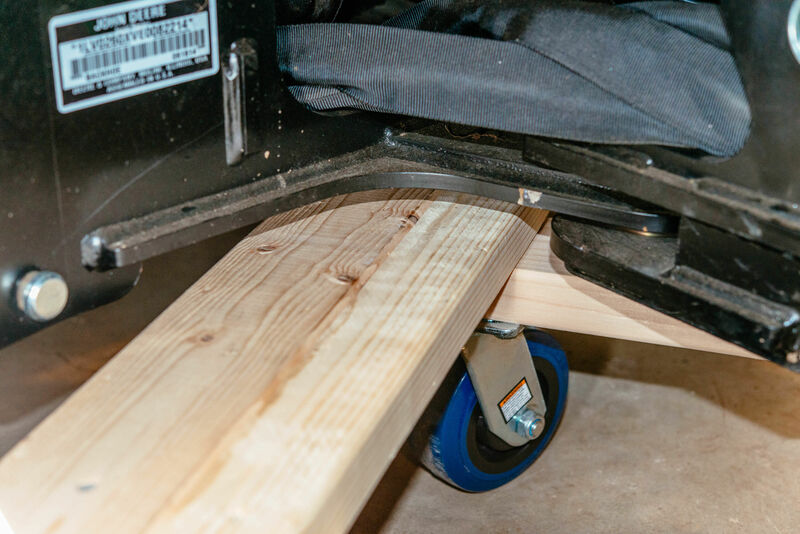 I think that means 6” casters might fit if mounted to the horizontal supports on the dolly. Other 5” casters would be shorter, but I think they would still be big enough for the backhoe to go “up” and lift off of the subframe without use of the stabilizers. The reason I’d consider other casters is to get something with locks. I have nightmares of the backhoe rolling over and smashing my beautiful fiberglass kayak!